Imagine that every bird you see is brown. Little brown jobs. Big brown jobs. Streaky, plain, identical. They’re no longer in their bright (and easily identified) breeding duds. Rather, they’re playing hard to see—and hard to identify. Now imagine that they’re all far, far away—at the water’s edge on the far side of the reservoir, waaay out in the field, sitting on that distant fence rail—and if you try to sneak up for a closer look, they fly away. And finally, imagine that an entire summer’s worth of baby birds have all left their nests and joined the crowd, sporting their juvenile plumage. Got it? That’s the downside challenge of fall birding. There are plenty of perks, too. The weather has started to cool off a bit (at least here in Colorado). Summer crowds have left many popular vacation spots (which are often where the best birds hang out), leaving us to bird in peace. And best of all, there are migrants. Hundreds of migrants. Thousands of migrants. Instead of us having to travel to eastern states, the forests or tundra of the north, or central (or southern!) America, the birds have come to us. Of course we need to go see them! When the Colorado Field Ornithologists first announced that our 2014 convention was to be in Sterling, in the far northeastern corner of our state, I was dubious. Late August out on the plains tends to be sizzling hot, and we’d be out in the sun all day. Sterling wasn’t exactly a vacation spot, either. With all of Colorado to choose from, why would we ever want to go there? It turned out that there were lots of reasons to go to Sterling. 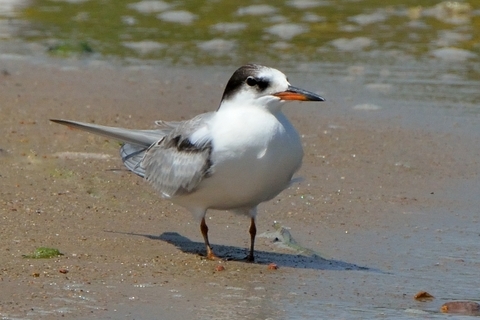 The abundance of reservoirs in the area attract migrating shorebirds. 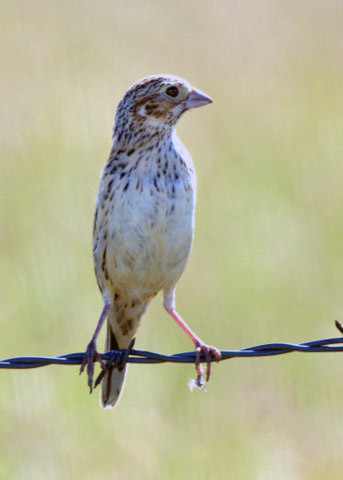 The fields are full of sparrows. And the few damp and green spots must seem an oasis to tired and hungry songbirds heading south for the winter. My first field trip was to Jackson Lake State Park. Normally, this late in the season the water has receded leaving wide, shallow or muddy areas perfect for sandpipers. This year, however, we’ve had lots of rain and the reservoir was still full. The boaters and fishermen were happy, but would we find any shorebirds on the one tiny beach area? It turned out that yes, there were shorebirds, just not a lot of them. What they lacked in numbers, they made up for in variety. It seemed as if there was one of each species: Killdeer, Spotted Sandpiper, Yellowlegs species, Semipalmated Sandpiper, Sanderling, Wilson’s Phalarope. I happily celebrated the Common Tern—a bird I’d been lacking on my life list—and I even scored a photo from a nearby jetty. For a while, a pair of Wilson’s Snipes had everyone fooled into thinking they were dowitchers—pretty funny when you consider I was birding with a lot of highly qualified experts. Someone had blurted out “dowitcher” and that’s what our brains saw. It’s amazing what the power of suggestion can do! We finally realized our mistake and had a good laugh at ourselves. Even with that faux pas, I was grateful for the trip leaders and other “power birders” who were able to ID most birds with just a glance. Shorebirds have a tendency to look alike, and getting a close view was nearly impossible. I would have been there all day, squinting through my scope and thumbing through my field guide. Yes, I learned a lot, but I still have a long way to go! Looking away from the lake, we noticed raptors—Swainson’s and Red-tailed Hawks, Turkey Vultures and Northern Harriers—soaring overhead. 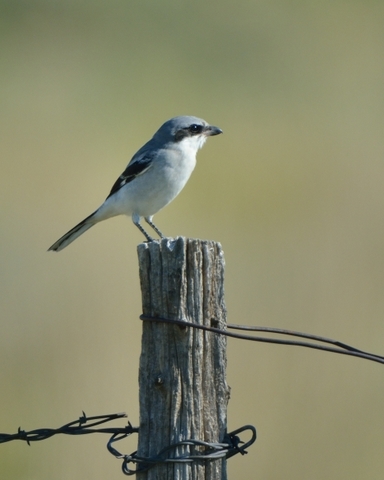 A Loggerhead Shrike glared at us from a near-by fence post. Orchard Orioles flitted through the cottonwoods while late-migrating swallows flew sorties overhead. A Great Egret was easy to pick out; so was the White-faced Ibis. It was only the first day, and I already had a new lifer. Maybe birding the plains wasn’t such a bad idea! Birds, from the top: Vesper Sparrow, Common Tern, Wilson’s Snipe, Loggerhead Shrike.